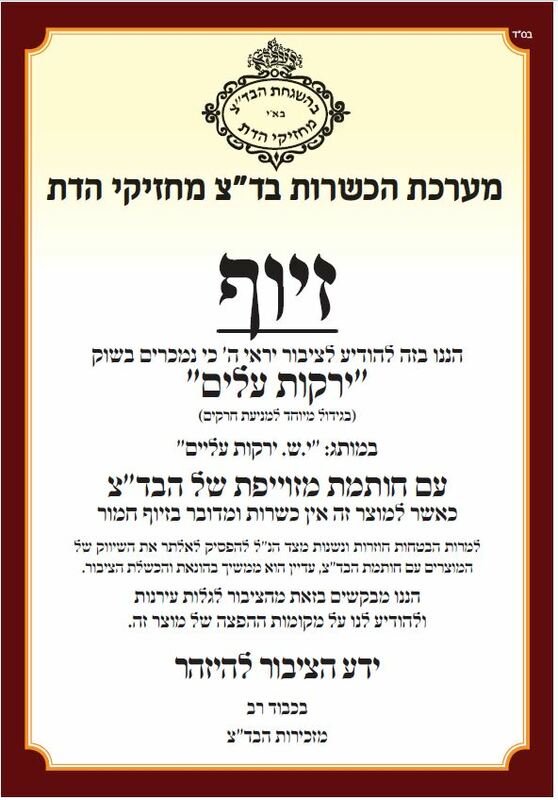 Badatz Machzikei Hadas (Belz) announces today that ‘gush katif’ “Yerakot Ali’im” (ירקות עלים) under the brand name Yud. Sin. Yerakot Eilim are using the Belz hashgacha without authorization and the badatz does not provide supervision for this product. A The badatz has made numerous attempts but the company has ignored them to date and continues using the badatz logo without authorization. Posted on December 13, 2016 by JKN Israel. This entry was posted in JKN Alerts. Bookmark the permalink. This is the same company from whom I found a large slug in their greens despite 4(!) different hechsherim on the bag! They never addressed the situation to my satisfaction and I have never bought their products since. P.P.S. I’ll be happy to send you a picture if you want.